As New York City death metal outfit HYPOXIA – featuring within its ranks members of Monstrosity, Secrecy, Castrator, Lethal Entity, and more – prepares to release its new Abhorrent Disease full-length through Selfmadegod Records next week, Heavy Blog Is Heavy has debuted the decimating new single, “Despise.” The band has also booked a hometown release show for the album which hits Brooklyn this Friday ahead of the record’s official unveiling. HYPOXIA has created their most vicious outing yet with Abhorrent Disease. Recorded at Full Force Studios (Suffocation, Internal Bleeding, Dehumanized), the album delivers a nearly forty-minute onslaught of death metal hate, with belligerent vocal devastation, deep-set hooks, and furious blasts attacking the listener with every track. Abhorrent Disease was completed with cover art created by Daemorph (The Black Dahlia Murder, Avulsed, Pyrexia). Stream HYPOXIA’s “Despise” at Heavy Blog Is Heavy RIGHT HERE. Also see the official video for “Condemned To The Abyss” HERE. Selfmadegod Records will release HYPOXIA’s Abhorrent Disease on CD and all digital platforms next Friday, April 26th. Find preorders at the label webshop HERE and Bandcamp HERE, and through the band’s store HERE. 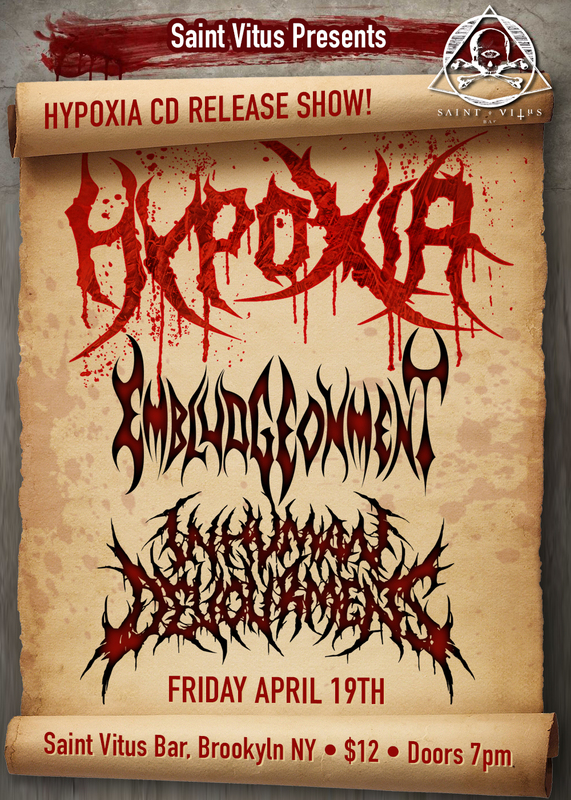 HYPOXIA’s hometown release show for Abhorrent Disease is scheduled for this Friday, April 19th, at Brooklyn’s popular watering hole, Saint Vitus Bar. Additional brutality will be served by Inhuman Devourment and Embludgeonment. Watch for additional tour dates and more to be issued shortly. 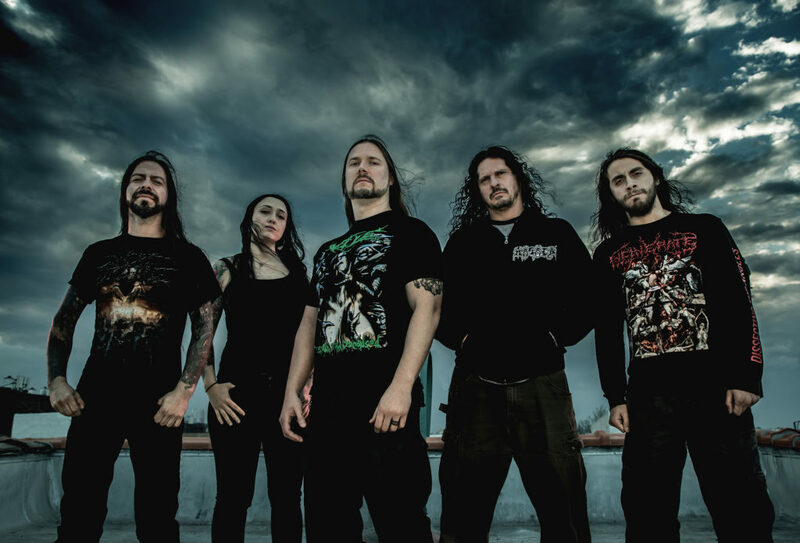 HYPOXIA was founded in 2008 by drummer Carolina Perez and guitarist Carlos Arboleda, after which guitarist Nadher Tabash and bassist Michael Poggione joined the lineup. In 2011, they released their first demo, The Purge, but the 2013-released follow-up, Public Execution, is where the band’s name started making waves beyond their local scene. In 2015, HYPOXIA recruited Monstrosity and Vile vocalist Mike Hrubovcak into the band, and recorded their debut full-length, Despondent Death, which they recorded at Joe Cincotta’s Full Force Studios on Long Island and released through Czech Republic-based Ultimate Massacre Records. HYPOXIA is well known for their energetic and aggressive live shows, having performed at many festivals and shows all over North and South America including Soul Metalfest, Las Vegas Deathfest, and one of the Biggest Festivals of South America; The Rock al Parque Festival in Colombia. Along the way, HYPOXIA has shared the stage with bands such as Suffocation, Cattle Decapitation, Dark Tranquility, Dark Funeral, Diabolic, Obituary, Onslaught, Razor, Masacre, Embalmer, Exumer, Malevolent Creation, Derketa, and many others.